Another striking “ala round” design from Glendon Place. Braids and Mill Hill Beads. 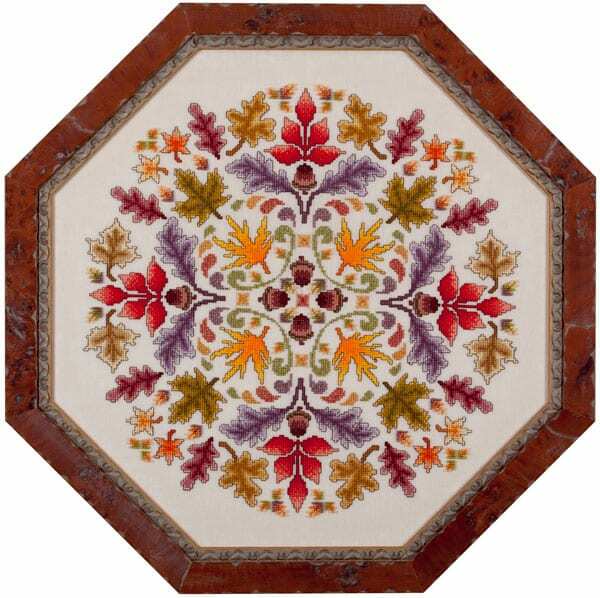 Fabric: Stitched on 28ct “White Chocolate” Linen by Wichelt Imports, Inc. White Chocolate is a creamy, rich, solid color that proves to be an excellent background color against all the rich colors of the fall leaves in the design. Click on the photo below to access the fabric. Design Area: 14″w X 14″ (Round). Purchasing a fat quarter (1/4 yard) will work sufficiently, but will only allow 2″ of selvage on the left and right sides. The model was stitched using a fat quarter and there was plenty of selvage for framing. Fibers and Embellishments: A total of 43 colors of Sullivans floss, 4 colors of Kreinik #4 Very Fine Braid, and 4 colors of Mill Hill Beads were used in the model. DMC and Anchor comparable colors are also provided. If you are interested in purchasing the embellishment package, which includes everything but the regular floss, click on the photo below.